To have a lot on your plate means: to have a lot of things to do”. For example: Sorry, I can’t go clubbing with you tonight because I have a lot on my plate right now. 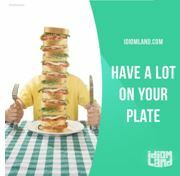 Posted on Jul 25, 2016 Jul 24, 2016 by Inglés MálagaPosted in VocabularyTagged idiom, lifestyle. Next Next post: Turn on the oven Janette. No way casanova!